Edit: Registrations are now closed. Join us for a new 10 week challenge beginning in October, 2019. Registrations will open in September. 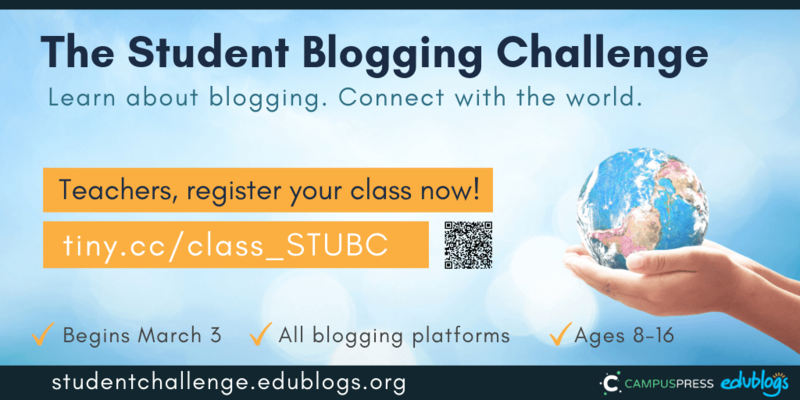 Registrations are now open for the next Student Blogging Challenge! This is a way for classes to learn about blogging while connecting with other classes around the world. This form is for teachers to register classes. Register individual student bloggers here. Before filling in the registration form below, please read the following information. Note: Your blog must be public on the web with comments enabled in order to participate. Please read this important information for teachers. Mailing List: Make sure you’ve signed up for our mailing list to get all the Student Blogging Challenge news sent to you as well as the weekly posts. Click here for the mailing list sign up form. FAQs: Please read through the Frequently Asked Question guide which explains more about the challenge. Contact Email: The last question on the registration form asks for a teacher email address. This will be kept private and will not be published. It’s just in case I need to contact you throughout the challenge. This will not sign you up for the mailing list. Please do that here if you haven’t already. There are a few things you can do prior to the challenge to make sure you’re ready to go on March 3. A few days after registering, check the page with the list of participating classes. Look for ‘2019 Classes’ in the header area of this blog. Check this list prior to March 3 to make sure you are on the list and your details are correct. If you are not listed on the participants’ page, register again being careful that your blog URL is correct. Check out the family information note and consider whether this would be useful to give to your students’ families. Consider starting the Edublogs Blogging With Students self-paced course if you’re new to blogging and need to get your blog set up before beginning. Make sure you have at least one post published on your blog so others can leave comments when they visit. Start visiting other classes of similar grade level on the participant list if you have time. Spread the word! Invite your colleagues and PLN to join in. The Twitter hashtag is #STUBC. There will be some more reminder posts on the Student Blogging Challenge site before we begin. Ready to join us? Simply fill out the form below or click here to open it in your browser. Please fill out the form once. Any questions? Leave a comment below and I’ll get back to you! I am afraid I listed my class blog incorrectly. Is there a way for me to correct it? Question – I have registered all my students, i can see the list in student users but i cannot see any of their student blogs. I feel it takes a long time for the website to register and show the admin/teacher url in the student blogs so that they can join My Class. I see you only created student Users for your class and not Student Blogs. There is no wait time. If you use My Class > Create Student Blogs in batches of 6, they get added immediately. If the blogs are created by the student, they need to follow the instructions here: https://help.edublogs.org/join-class/. Looking forward, I and my students are new to this. Its very difficult to hold the students interest and focus on anything these days. Am hoping this will do it. Students are excited to meet more students from around the world and share ideas and opinions. This sounds quite exciting! I am looking forward to wrapping my brain around all of the details before the challenge begins. Since this is my first time, I am starting off with a class blog, but I have a couple of questions. 2. If I create only a class blog, should my students also complete the introductory lessons? 1) Yes, if you have students who are ready to start their own blog after we’ve started, that’s no problem. They’d just complete their task on their own blog and then submit the URL of the published post on our weekly Google Form. That way, our commenters and others will be able to visit their blogs. 2) Do you mean the Student Blogging Bootcamp? This is designed for students with their own blogs so they don’t need to complete this if they’re just part of a class with a class blog. Please get back to me with any other questions! Thank you for such a clear and thorough response. I will proceed with educating myself on how all of the challenge will work from an individual teacher with a class blog. Your rapid response is also appreciated. I think my class is registered, but I do not go to a class blog link when I check on it. Maybe I’m not looking in the right place. The entire journey sounds fantastic. We are excited to participate in the upcoming challenge! Hello, I hope to be in touch. Many thanks.